Freshly painted desks in bright colors and adorned with flowers, hearts, peace signs, animals and clouds lined Manchester Plaza Wednesday. 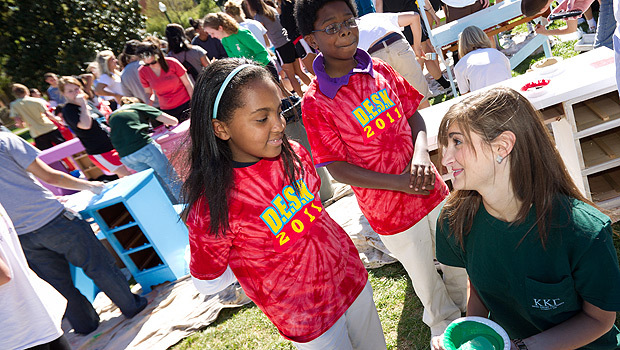 Several hundred Wake Forest students welcomed about 50 elementary school students to campus to paint their very own desk during the annual D.E.S.K. project. Wake Forest students started D.E.S.K. (Discovering Education through Student Knowledge) 11 years ago to provide desks to underprivileged children who needed a place to study and learn in their homes. This year, 55 students from Old Town Elementary School received desks. Organizers buy the desks from thrift stores and Craigslist. Teams of Wake Forest students — representing fraternities and sororities, sports teams, religious groups and Student Government — were matched with Old Town students. A member of each team visited their student at Old Town several weeks ago to talk about their interests and what they would like to see painted on their desk. Diana, a fifth grader from Old Town, said she wanted a quote on her desk: “May Peace Prevail.” Wednesday, she watched as members of the Phi Mu sorority painted her desk yellow, purple, green and blue before adding the words “Peace,” “Love,” and “Happiness,” and finally her quote in multiple colors. “I love it when the students get here and they’re so excited to see their ideas painted on their desk,” said Samantha Hess, a senior from Mohnton, Pa., and another one of the event organizers.